Born 16 September 1887 in Straßburg (or Strasbourg), died 1966. Sculptor, painter and poet. Visited Paris in 1904 and was deeply impressed by the modern paintings. Went to Weimar and attended courses at the academy under Professor Ludwig von Hoffmann from 1905 to 1907. Spent some time at the Julian Academy of Paris in 1908. After that, he went to Weggis, Switzerland, where he worked for some years in solitude. Met the painters W. Gimmi, W. Helbig and Oskar Lüthy with whom he founded the "Moderner Bund" ("Modern League") in 1911. Was one of the organizers of the first exhibition of "Der moderne Bund" in Lucerne, showing works by Amiet, Arp, Friesz, Gauguin, Gimmi, Helbig, Hodler, Lüthy, Matisse, and Picasso. Visited Kandinsky in Munich in 1911, who requested his (Arp's) collaboration on the book "Der blaue Reiter" ("The Blue Rider"). Took part in the second "Blauer Reiter" exhibition in Munich in 1912, and at the second "Moderner Bund" exhibition in Zurich in 1913. Contributed drawings to the Berlin periodical "Der Sturm" ("The Storm"). Took part in the "First German Autumn Saloon" at "Der Sturm" gallery in Berlin in 1913. Met Apollinaire, Arthur Cravan, Max Jacob, Picasso, and Modigliani in Paris, in 1914, the latter drawing his portrait. After the declaration of war, he returned to Switzerland. Exhibited his first abstract works (rectangular forms), collages, and tapestries, together with worrks by Otto and Mme. van Rees, at the Tanner Gallery, Zürich, in November 1915. During this exhibition he met Sophie Taeuber, whom he later married. Co-founder of the Zürich DaDa movement in 1916. Illustrated Tristan Tzara's "25 Poems" and Huelsenbeck's "Fantastic Prayers," the latter with woodcuts which he called "Studies in Symmetry." In his reminiscenes, "Dadaland," Arp writes, "I met Tzara and Serner at the 'Odeon' and the 'Café Terasse' in Zürich, where we were writing a cycle of poems called 'Hyperbole of the Crocodile-Hairdresser and the Walking-Stick.' This kind of poem was later called 'Automatic Poetry.'" In 1917 he created his first abstract wooden reliefs. Exhibited at the first Zürich DaDa exhibition. In the Zürich DaDa-publications "Cabaret Voltaire," "Dada" (issues 1-3), and "391" (issue #8), he published illustrations; in "Dada" (issue 4/5) and "Der Zeltweg" he published illustrations and poems. 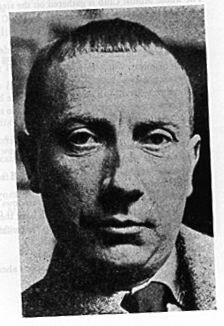 In 1919 he travelled to Cologne (Köln), and founded the Cologne DaDa group with Max Ernst and Johannes Baargeld. Contributed to the publication "Schammade," and created the "Fatagaga" pictures with Ernst. Short stay in Berlin, where he met El Lissitzky, Kurt Schwitters and other DaDaists. Published "Die Wolkenpumpe" ("The Cloud Pump"), a series of poems, and "Der Vogel Selbdritt" ("The Bird Thrice with Itself"), a collection of poems and woodcuts. Collective publication of "Dada in Tyrol, Au Grand Air, Der Sängerkrieg." In 1922 he married Sophie Taeuber. Collaboration with Kurt Schwitters on the latter's periodical "Merz" in 1923. Published, with El Lissitzky, "Isms in Art," in which he defined DaDa: "Dadaism has launched an attack on the fine arts. It has declared art to be a magic opening of the bowels, administered an enema to the Venus of Milo, and finally enabled 'Laocoon and Sons' to ease themselves after a thousand-year struggle with the rattlesnake. Dadaism has reduced positive and negative to utter nonsense. It has been destructive in order to achieve indifference." Participated at the first collective exhibition of surrealists at the Pierre Gallery, Paris, with de Chirico, Ernst, Klee, Man Ray, Masson, Miro, and Picasso.